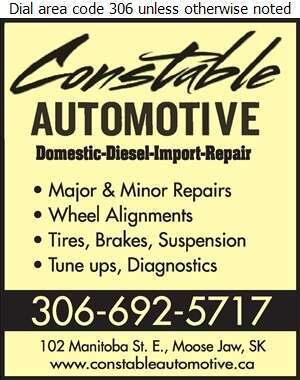 Constable Automotive is a locally owned full service shop specializing in domestic, diesel, and import repairs. From tune-ups, wheel alignments and oil changes, to tire rotations and new tires, Constable Automotive does it all. In their 70 years of business, Constable Automotive's success comes from providing quality service and repairs to Moose Jaw and the surrounding area. Their dedication and hard work will help you get back on the road as soon as possible. Call or visit them today!